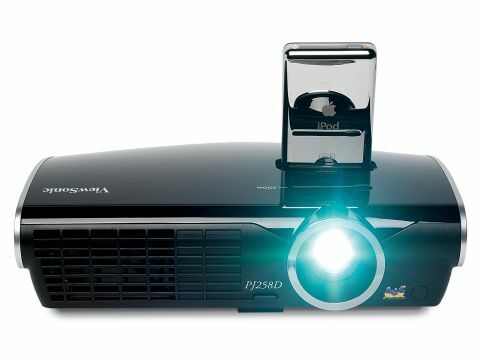 While Viewsonic's earlier 'made for iPod' LCD monitor failed to live up to its claims, there's no need to doubt the company's latest iPod-accessorised projector. Popping its tiny, shiny blackness into the provided zip case, you can carry it around in a shoulder bag. The PJ258D isn't aimed at those users who rate picture or audio quality as paramount. On the unit's rear, alongside inputs for S-video, composite video, VGA for a PC and a USB service port, are some speakers. This is a nice idea, but even with these weedy things turned up to 100 per cent it's still tricky to hear. Luckily, there's a 3.5mm jack for outputting to a separate sound system. Missing from the back is a HDMI socket, component video input and any dedicated stereo outputs, so high definition is not an option. This projector is so small, though, it's hard to think how ViewSonic could have squeezed on any more ins and outs. That said, its 1,024 x 768 pixel resolution does mean that hi-def footage can be shown from a laptop that's hooked-up via a VGA cable. There are also warning lights on the back of the unit that tell you if the projector bulb is about to blow, as well as when the unit itself is overheating. The latter proves important, because the PJ258D gets really hot during playback, probably connected to the fact that it's also very noisy. ViewSonic admits it runs at 37dB - about the same volume as a microwave oven. The PJ258D can take only 5G iPods, with cradles included for just the 30GB and 60GB versions, which will also recharge when attached. Using the PJ258D is easy enough. A tiny remote control is included that can be used, from the rear or front, to access the very basic onscreen menus, alter volume and change the video source - although the latter is automatic. Just slip an iPod into the top of the unit (forget ceiling mounting), select a video file and the projector immediately begins playing it directly from the Apple device, provided 'TV out' in the iPod's video settings menu is set to PAL format. Using footage converted into 640 x 480 resolution MP4 files from a DVD, the picture lacks detail even when kept below the 50in size. This can only ever be a candidate for the iPod-obsessed. Still, contrast levels are impressive and there's plenty of brightness to images. Some motion artefacts are obvious, but the iPod's raison d'être is convenience, not quality, so most of the picture flaws we spotted are undoubtedly its fault. We're not convinced there's a market out there for this product, but if you really need to play video from an iPod, the PJ258D offers impressively simple integration and acceptable picture quality.